The view of the ocean and coastal pasture makes guests exclaim "wow" as they enter the dutch doors of this cozy cottage. This is a place to relax. You can watch the whales play and hear them sing at night. The cows lazily graze through the pasture below with the Big Island of Hawaii off in the distance. Sunrises and sunsets offer stunning colors across the sky. You can also appreciate the views from the comfort of your bed. We have stocked the cottage with all of the amenities you will need to make you feel right at home. For the more adventurous, there are hikes, beaches, and waterfalls nearby. Haleakala National Park (7 Sacred Pools) is located 4 miles south of the cottage and Hamoa Beach is 3.5 miles north. A small fresh water pond is only 1/4 mile down the road. My name is Michelle and I manage this heavenly cottage for and old family friend, Chuck. This cottage is truly a hidden gem and it brings me great joy to be able to help share it with guests. Their gratitude is a constant reminder of how special this place is that we call home. Many of our guests return annually. They all say the photos don't do the place justice. Everyone declares the view spectacular. There are 70 acres of government preserve between the cottage and the shore. Even so, when the whales are here (Dec-Apr), you can hear them splash and see them jump. Cattle and a few horses abound in the preserve you can watch their calves frolic. A thoroughly restful place. The serene views and private nature of the cottage offer a sanctuary of kinds for guests. Koali Ranch Cottage started out as a vacant lot set aside for a school house. In 1955, the Territory of Hawaii decided that it did not need a school there and auctioned it. Chuck's parents were successful bidders. The Territory insisted that the house be erected within a year. The cottage was designed by local architect John Tatum working with island famous Val Ossipoff. You are rural. Sometimes cattle come right up to the lanai. You are about five miles south of the little village of Hana. We have a few lunch stands and sometimes even breakfast and dinner. Most people bring their own food. We are on the side of Haleakala and when it is not cloudy you can see up to about 5,000 feet. On clear days (Hawaii) is some 40 miles south and east; you can see all four Big Island peaks. You view the channel between Maui and the Big Island (Hawaii) across 80 acres of pasture down to the rocky coastline. The name of the channel is Alanuihaha. It is about 40 miles wide. Koali Ranch Cottage is 300 feet up and about 1,000 unobstructed feet away from the ocean. Check out the view. Coffee filters, paper towels, napkins, salt and pepper. Many of our guests return annually. They all say the photos on the web don't do the place justice. Everyone declares the view spectacular. There are 70 acres of government preserve between the cottage and the shore. Even so, when the whales are here (Dec/Apr), you can hear them splash and see them jump. Cattle and a few horses abound in the preserve you can watch their calves frolic. A thoroughly restful place. Great place to stay in Hana! Everything you need is there. Loved having the cows come up to the balcony in the late afternoon. Simply paradise! Recently stayed at the cottage for a few days during our honeymoon. It was an amazing place to be able to come back to after a day of exploration. Very comfortable and the veiw is unbeatable. Newer sliding doors to the lanai and good outdoor seating. Know your expextations before booking, this place isn’t brand new but super functional and still very comfortable. Loved how peaceful and quiet it was. If you’re lucky you might catch whales just off the coast or cows up to the fence. Thank you for your pleasant review. Many honeymooners come and their comments are similar to yours. They don't seem to mind the cattle and the lack of dishwasher. Please come again. 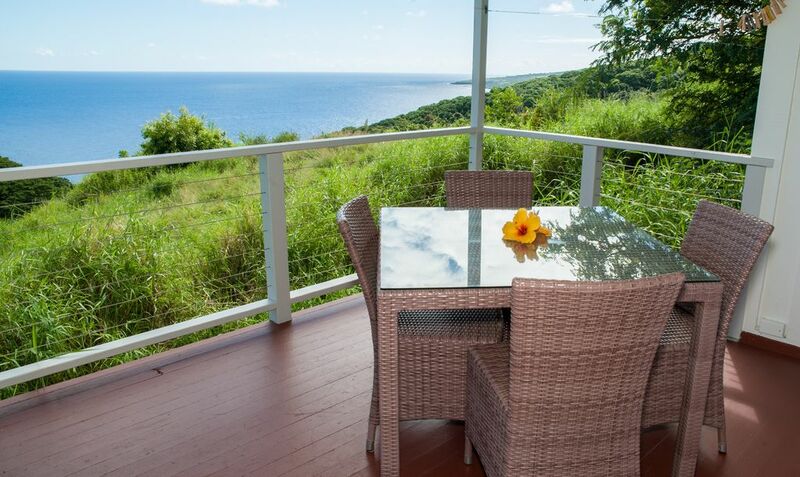 Charming and rustic with a million-dollar panoramic ocean view, this property is in an excellent location for exploring the Hana area. There are interesting areas to explore; however, plan to spend time on the wonderful lanai too (soundtrack provided by birds and cows). Although a studio, we found the cottage to be quite spacious and comfortable. Windows across the entire length of the cottage allow a great view even from the bed - more stars in the night sky than I've ever seen! Thank you very much for the review. We are thrilled that you were able to relax and enjoy your stay. We hope to see you again one day! We loved the peaceful setting of this cottage and the incredible view. It offered everything we needed and the fresh fruit and banana bread was a wonderful surprise. We were looking for a place so we could take our time traveling the Road to Hana and this was perfect for our needs. We especially loved sitting on the deck at the end of the day. Thank you! The peaceful quiet contemplative setting was the perfect ending of the usual touristy Maui vacation. Prompt attention to a failed bathroom sink drain on the weekend was appreciated. Thank you for your excellent review of Koali Ranch Cottage. We especially like feedback. I am sorry that you had to put up with the bathroom sink issue. We have checked and it is ok now. atop Mauna Kea on the island of Hawaii. Then they enjoy the swirling colors as the sun sets. You don't see the sun go into the ocean, but if it rains you can often see rainbows over the ocean). We will accept bookings for 2 or 1 night if there is a opening in the calendar. Please inquire for more information and pricing.